The leaf cutter ant, also know as the parasol ant, is one of a munber of social insects. Like bees, wasps, termites, and some aphids, the leaf cutter ant is part of a colony that rely on group integration and a division of labor. Leaf cutter ants are a great example of mutualism. 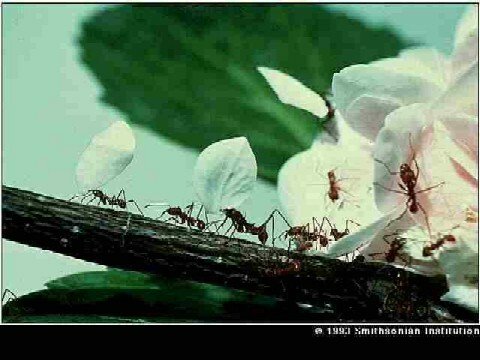 Mutualism is a type of symbiotic relationship in which both partners benefit from the relationship. Leaf cutter ants cut various types of foliage into pieces. They then carry these cut leaves back to their colony where they grind up the plant matter. They then inoculate the leaves with a fungus. 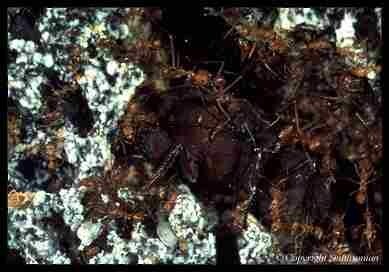 The harvested fungus is then used as a food source for the ant colony. Apart from humans, leaf cutter ants are the only species that is able to make their own food. To protect these fungus gardens, the leaf cutter ants rely on a type of bacteria, which lives on thier skin, to combat invading fungi pests. The relationship between the leaf cutter ant, fungus, and bacteria is one of the most amazing examples of mutualism in nature.